How can Evaneos help media? Kate Russell of National Geographic knows that travellers are using traditional guidebooks less and less. She names Evaneos' innovative concept of personal, tailor-made itineraries as one of the most exciting waves in the future of trip planning. Daily Mail Online writer Fred Mawer breaks down the Evaneos advantage to travelling, explaining to travellers how local agents help them get a better deal and a better experience in far-flung destinations. Part of a continuing series highlighting the advantage to getting an insider's perspective on cities around the world, Evaneos Local Agent Sonia gave About Time all the best local bars, restaurants and sites in Brisbane, Australia. Evaneos' popular 6-day kayak trip organized by our local agents through fjords of western Norway ranks among Wanderlust editor's top picks for the travellers seeking adventure in the region. Move over standardised tour packages - after Evaneos' incredible funding round of $21m, we're even keener than ever to bring unique, tailor-made holidays designed by local travel agents to the world over! Find out what Tech Crunch had to say about this amazing investment announcement. A funding round of $21 million isn't a feat to go unnoticed! 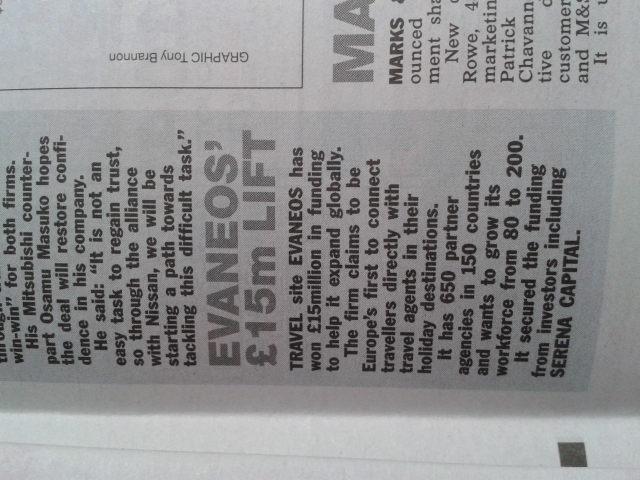 The Evaneos name is rapidly growing in popularity on an international scale, so we were happy to see The Sun writing about our company's tremendous achievement! We were thrilled that the Sunday Times' 'Travel Doctor' put forward Evaneos as a solution to overpriced tour packages. By cutting out the middleman, we're proud to be promoting the local economies of on-site agents, and for our travellers, local agents means local prices! When it comes to finding authentic, off-the-beaten-track adventures abroad, there's no one better to ask than our local travel experts! Nick Boulos from The Metro's 'Escape' section approached Evaneos to ask for some incredible holiday ideas in Laos. Greenland, Australia, Peru, Mongolia, Iran, South Korea, India, Costa Rica, Botswana, Brazil - ten incredible destinations to set your sights on this summer! Greenland, Peru, Australia, Mongolia, South Korea, Iran, India, Botswana, Costa Rica, and Brazil - ten incredible destinations to consider when planning your travels for 2016, all reachable via Evaneos Travel! Read up on Dad Info's list, including a selection of our tour suggestions, and get your travel inspiration flowing! Breaking Travel News and Hospitality Times were happy to share that Evaneos' CEO and co-founder, Eric La Bonnardière, had been asked to make a speech on Responsible Travel and Sustainable Tourism at this year's ITB Berlin! As the list of '2016's Top Holiday Destinations' is updated with exotic new entries, you might be surprised to read that South Korea provides a fantastic alternative to Europe! The Daily Express got in touch with Evaneos Travel's local agent in South Korea, to find out about one of Asia's most unknown, but beautiful countries! With the Olympics approaching, it's no surprise that Brazil has been named a hot destination for summer. We were excited that the Irish Independent picked one of Evaneos' Brazil trip itineraries for their '50 Fab Holidays' list! Impressed with our platform that connects travellers with local, on-site travel agents, Sharknova included Evaneos in its list of 'Best Travel Apps & Websites of 2016.' With our handy i.O.S coming soon to iTunes, the entire site will also be available from your mobile in no time! Six years since the initial launch of Evaneos in France, the company has come a long way. Startup Empire got in touch to interview Evaneos' CEO, Eric la Bonnardière, about Evaneos' journey from 2009 to 2016! On 21st December 2015, Travel Daily UK asked Evaneos' co-founder and CEO some questions to gain an insight into the company revolutionising the travel industry! On 6th January 2016, Travel Mole, an online community for the Travel and Tourism Industry, interviewed Eric la Bonnardière about the launch of Evaneos Travel in the UK. The Deloitte Technology Fast 50 in Central Europe is a programme that recognises and profiles the 50 fastest-growing technology companies in the region. The entire Evaneos team is thrilled to have won one of these prestigious awards! On November 23rd, our talented team of web developers and programmers, including Yvan Wibaux, Evaneos' co-founder, were asked to give a company presentation at the Forum PHP Workshop in Paris! We're pleased to announce that Evaneos' CEO, Eric La Bonnardière, was selected for a BNP Paribas Young Entrepreneur Award 2015, for the region of Ile-de-France. The award was given in the 'Services' category, after the judges were impressed by the Evaneos concept of putting travellers directly in touch with local, on-the-ground travel agents. In 2014, Evaneos' collective French, Italian, German, and Spanish websites, won a Travel d'Or Award for the Best Online Travel Website! A year on, and Evaneos Travel, our UK website, is up and ready to follow their suit.